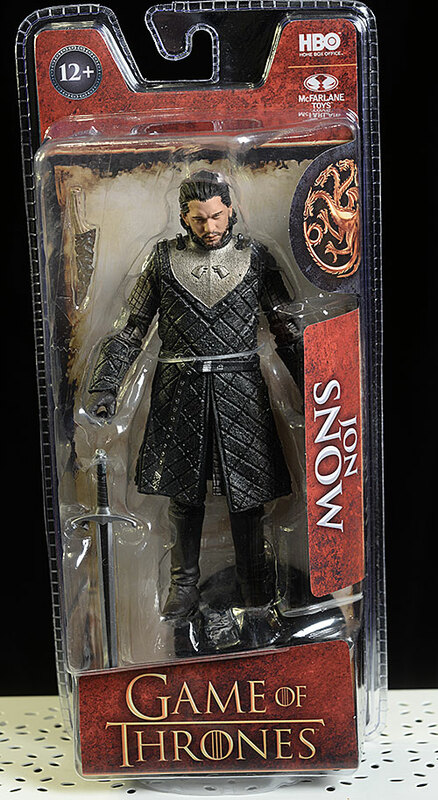 You know Game of Thrones season 8 is right around the corner when there's enough product out there to do two action figure reviews in a row! Earlier this week I looked at the sixth scale White Walker from ThreeZero, and tonight I'm checking out two of the first four figures in the 1/12 scale line from McFarlane Toys. This first wave consists of Jon Snow, the Night King, Arya Stark, and Daenerys Targaryen. I'm checking out Jon and the King tonight, and I'll cover the ladies soon. They're doing some dragons too, but these are in a smaller scale overall. In case you've forgotten, once upon a time McFarlane Toys was the emperor of action figures. Todd McFarlane revolutionized the market, and pretty much owned the aisles for years. If there was a license they wanted, they got it, and other companies were left to feed off the scraps. But all that changed as the company got out of touch with what made it great in the first place, and was replaced by others in the hearts and minds of collectors and retailers. 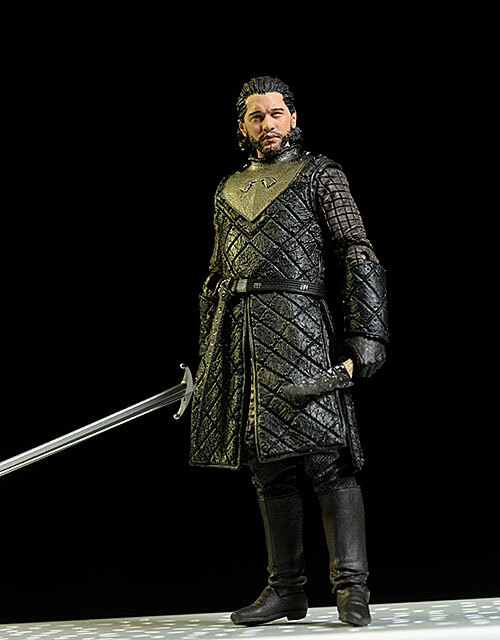 McFarlane has been making a push to return to glory, or at least the toy shelves, over the last couple years, but picking up the GoT license is one of their bigger steps in this journey. Will it be a leap or a stumble? I found these guys at Target, where they run $20 each. McFarlane started the clam shell packaging trend a long time ago, but eventually got away from it. This line returns to the solid design, with no way to get in without a blade. These are smaller though, similar to their recent 7" figures, and the interior card has some good artwork and info. No, it's not collector friendly, but it does show off the figure well, and in store theft will be near zero. Both sport terrific sculpts, once a hallmark for the company. I particularly like the Night King, with his sour demeanor and icy 'crown'. Jon's not bad, but there are a couple nits. 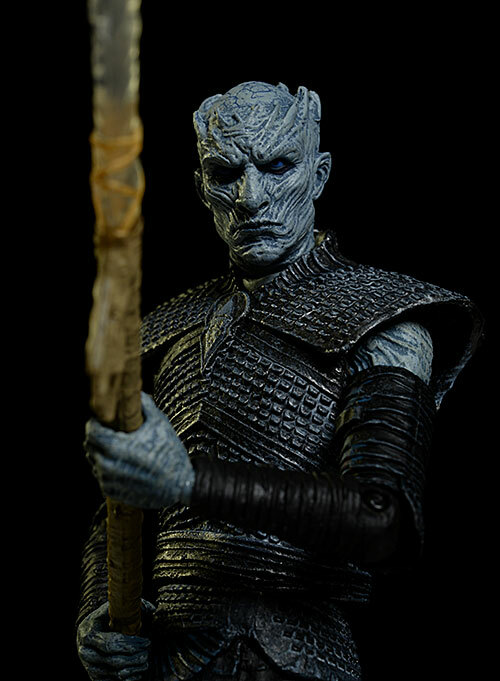 The Night King has a ton of surface detail in the face and costume. Remember, these are around 1/12 scale, similar to the One:12 line from Mezco minus the soft goods. Both of these stand about 6 1/2" tall, so the level of detail in the rough, frozen skin and complex armor is quite impressive. 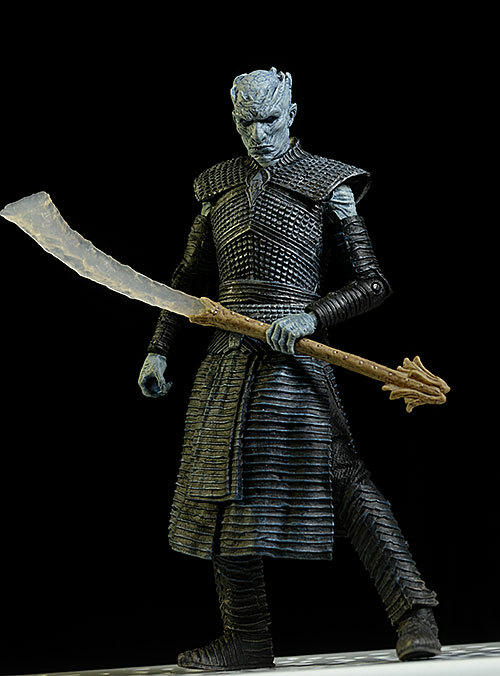 I do wish the spikes along his head were a little better defined, since these are really what sets him apart from other White Walkers, but you can see them. His costume looks accurate, and the soft materials do not impede the articulation unduly. It fits tightly around the torso, and looks great overall. The hard hands can be a bit difficult to work with, but they will hold the included accessories. Jon's portrait is solid work as well, and you'll recognize him immediately. In fact, you can pop the head off, give it to an average fan, and they'll know it's Jon. The cheeks are a smidge chubby, the lips a bit full, and I think they went a tad overboard on his trademark squint, but considering the size of the figure it's still well above the norm. My biggest issue with him is on the fit of the outfit. 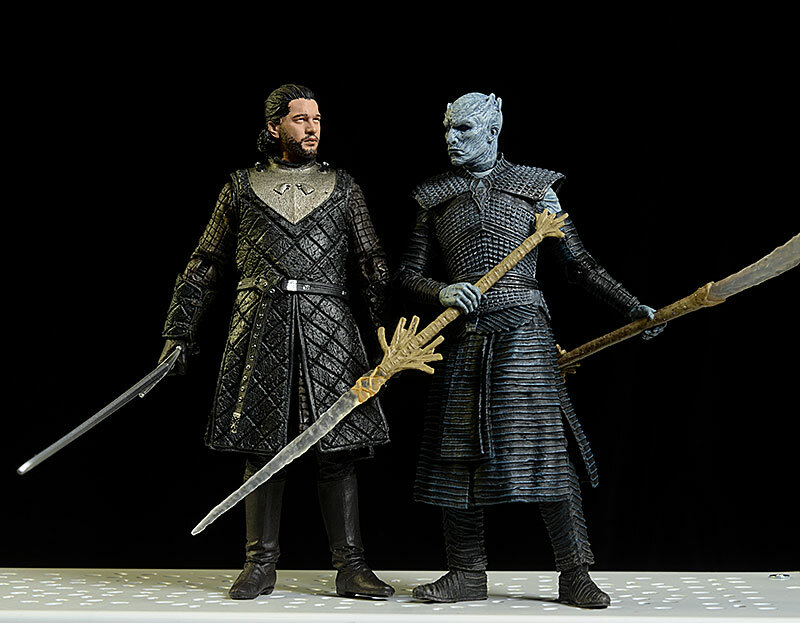 Like the Night King, there's a ton of surface detail, and they manage to create the look of various materials all in plastic. I'm particularly thrilled with the level of detail in the wolves on the chest - quite impressive! But the tunic itself is a bit of an odd fit, pooching out around the middle and making him appear more portly than he is. It's a minor nit to be sure, but holds him back slightly for me. 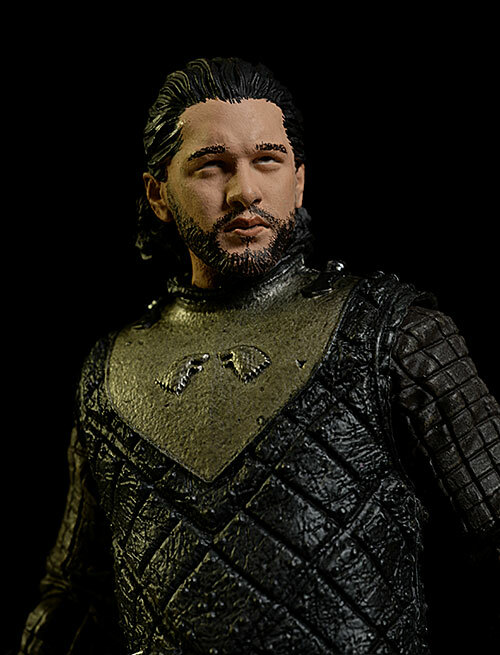 The work on both figures is quite good, but the skin and hair on Jon are particularly well done. 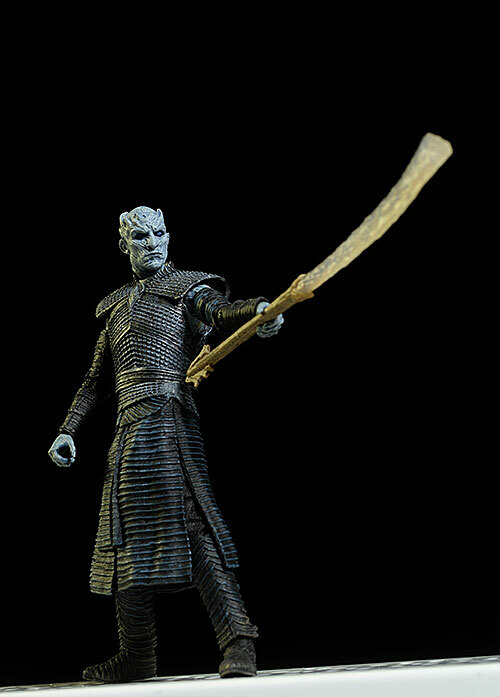 The frosty blue skin tone on the Night King is highlighted with a wash, bringing out the smallest details. The eyes are a vivid blue, hard to see without a macro lens but there nonetheless. The armor is dry brushed to highlight the craggy surface, and the smaller details are very clean. Jon has a consistent skin tone, and the hairline and beard edge look great. The eyebrows are a smidge much and the lips are a smidge dark, but the overall quality of the production paint is well above the average mass market release. 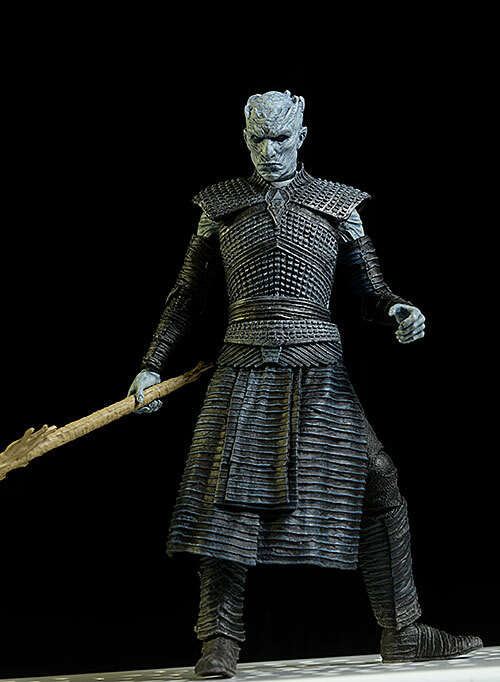 Like the Night King, there's great highlighting on the armor, and various paint colors and finishes create the illusion of different materials. People often believe incorrectly that McFarlane is the company of 'nerd hummels', action figures with little action. While that is true with certain lines, other lines have sported amazing articulation and posability - check out their Halo stuff for a great example. They got away from high levels of articulation with many of their more recent lines however, and are now making a welcome return to their roots with these. There's a decent ball jointed neck, as well as rotating hinge shoulders, elbows, and wrists. 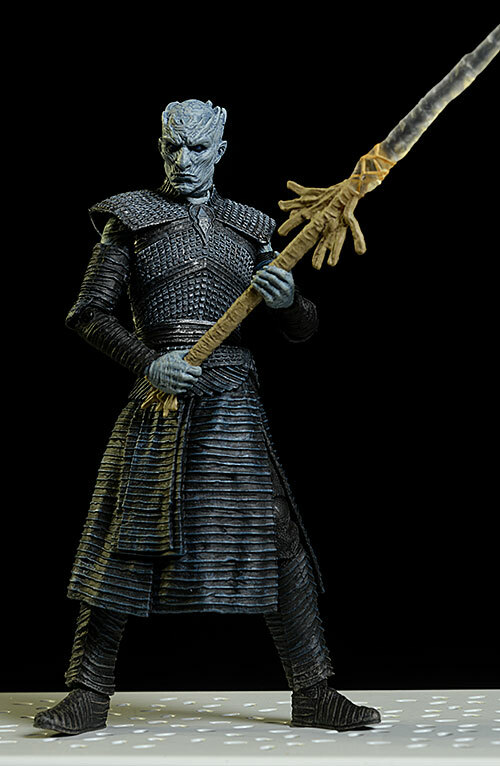 You can't quite get the arms across the body, but you can get some good two handed poses with the weapons, especially on the Night King. The waist is cut on the Night King, but Jon's armor covers the entire torso and pelvis. Both have rotating hinge hips (which ratchet), rotating hinge knees, and hinge ankles. While the legs work well in general, I wish there were more rocker movement in the ankles. I also had some weird issues with Jon's legs. While the level of articulation is decent, the right leg tended to look weird, not really lining up in a natural or realistic way. It's largely covered by the long tunic, but it was still wonky and odd when I worked with it. I didn't dock the score because of it, but it's still worth noting. Neither figure has a ton of extras, but they both have a couple useful goodies. 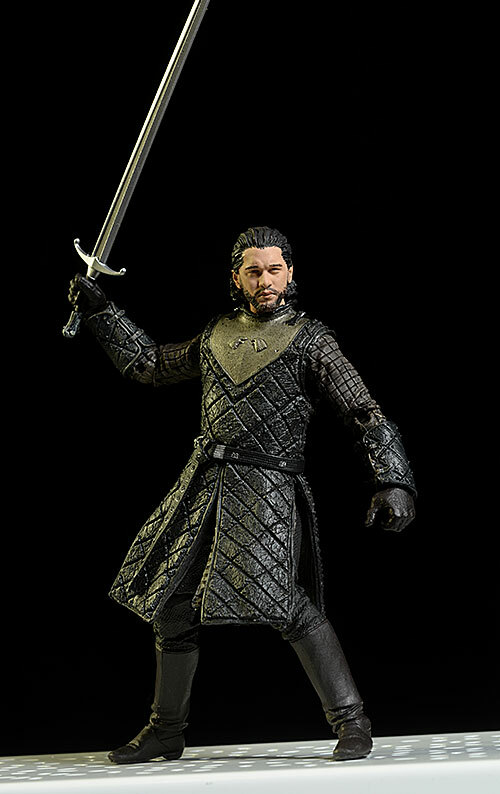 Jon comes with his sword of course, and the sculpted wolf head hilt looks great considering the tiny scale. 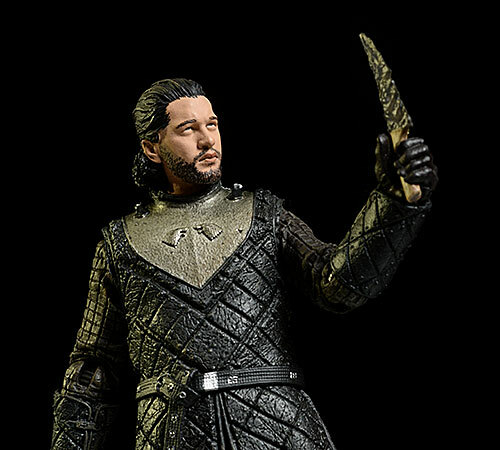 He also has an obsidian knife, perfect for putting an end to any White Walker. These fit in his tight, hard hands, but you'll have to pull the fingers open a bit first. 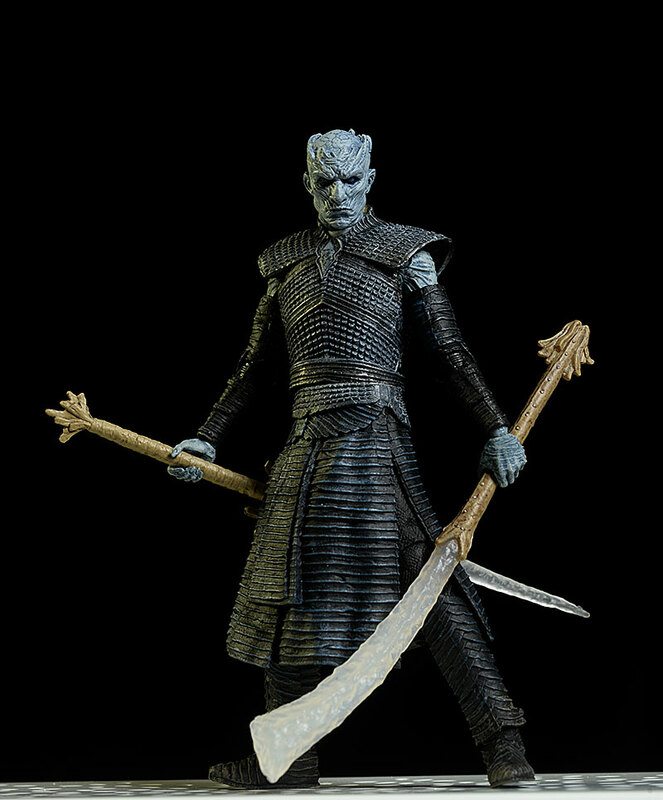 The Night King also has two weapons. One is the long ice spear, and the other is the large ice axe. These fit in his hands with a little effort, and you can get some decent two handed battle poses. I don't love the clumpy look to the sculpt on the spear shaft, but it's not surprising at this price point. They both have a small, round, black display stand with one foot peg and the show logo. You won't need it, but it may come in handy long term. With good articulation, a sturdy build, and several useful accessories, these will be a ton of fun for anyone looking to display them in multiple ways on the shelf or desk. They'd even make great toys for kids, if any kids were actually watching the show. By the way, I wouldn't recommend that unless you plan on paying for years of therapy. At $20 each, these are right in line with other 1/12 mass market toys like Star Wars Black or Marvel Legends. I suspect the license is fairly expensive as well, and the production numbers on these figures will be no where near as large as the other lines mentioned. Not a thing. The hard hands can be a little tricky to work with, but you'll get the hang of it. Things are looking up for this line, but it's still early. Solid work on both the sculpting and paint, and the articulation is much better than some of their other recent lines. I haven't found Arya yet, but as soon as I do I'll hit up her and Dany. I skipped the dragons, because they are so out of scale with the rest of the line. But I'm down for any additional waves they do, and with a cast as large as this, I hope they do quite a few. This is the first of the McFarlane figures. 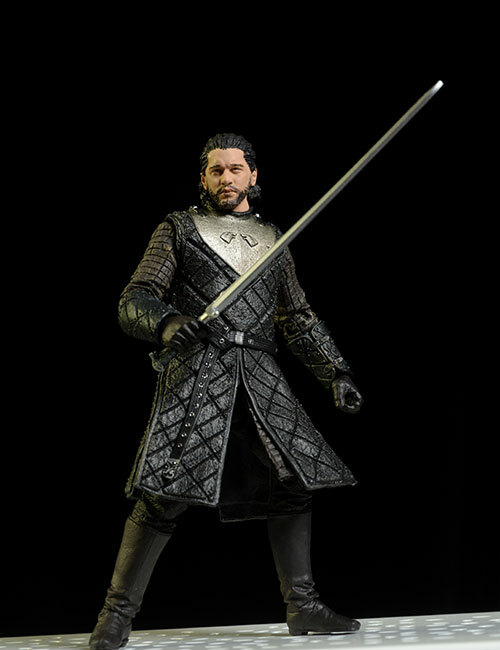 If you're looking for something bigger, check out the ThreeZero sixth scale releases, like the White Walker, Arya, Daenerys, The Hound, Jaime Lannister, Tyrion, Ned, and Jon Snow. If you're looking for something smaller, check out the 1/18 scale figures from Funko, or their 6" figures. And if articulation isn't your thing, there's the larger series from Dark Horse.